Happy New Years friends!! We ring in 2015 with bone-chilling cold weather (yay) and I am beginning it with a few resolutions like – staying in and cooking more. So, here’s my first attempt for 2015. Today I bring you a great Mediterranean dish that’s perfect to warm you up and help you forget about how freezing it is outside: Shakshuka. 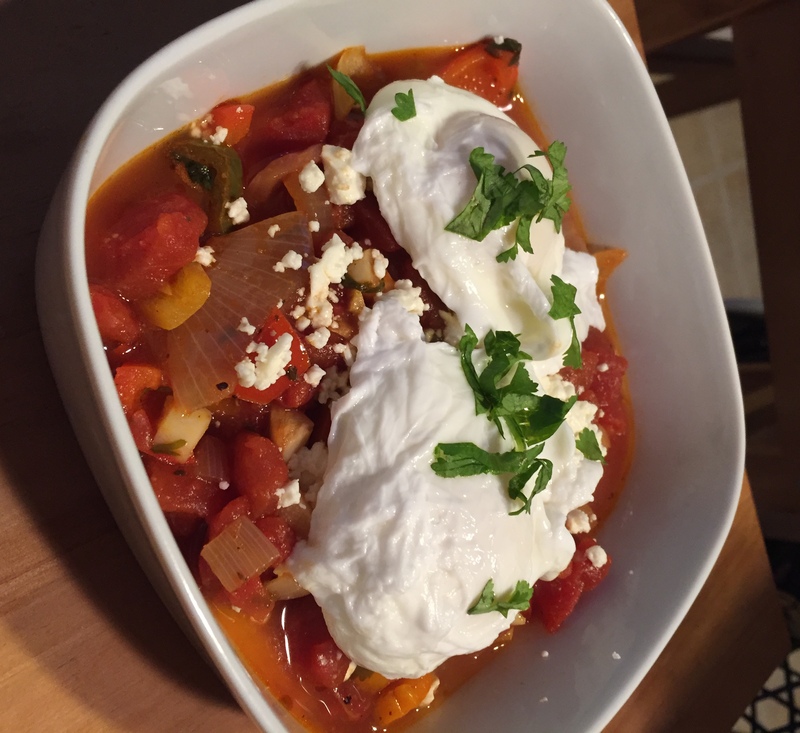 This Mediterranean stew is a delicious, healthy and very easy dish that I love to make for brunch during winter. Shakshuka (or sometimes spelled shakshouka) means “a mixture” in Arabic slang and is tomato-based sauce with chili peppers, onions and cumin with eggs poached in the sauce. It is a staple of Tunisian, Libyan, Algerian, Moroccan and Egyptian cuisine and is traditionally served in a cast iron pan with bread to soak up the sauce. Doesn’t that sound delicious? I mean, come on! 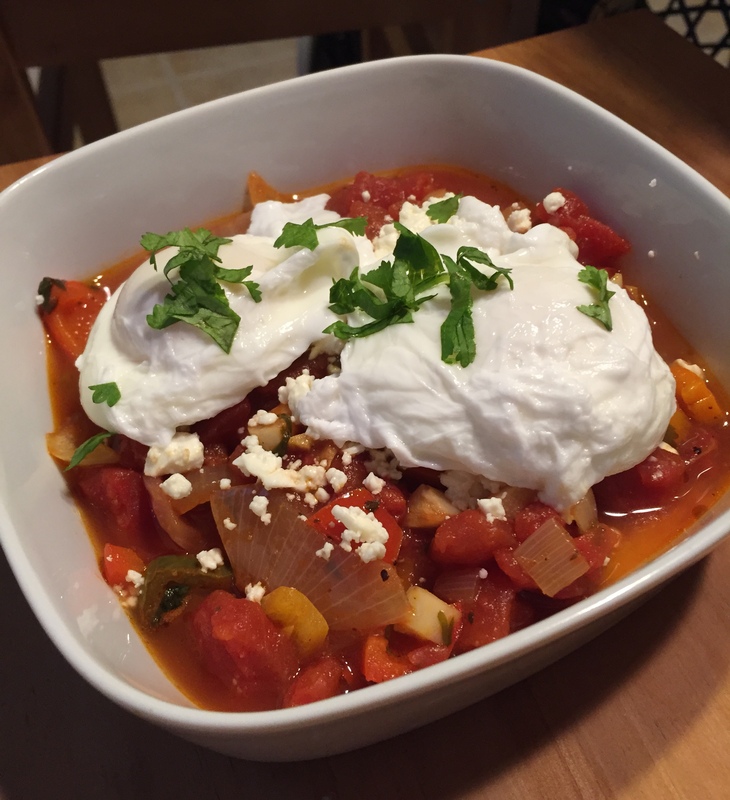 My version is slightly different than the traditional recipe as I make it a bit spicier and poach my eggs separately, but nonetheless, it is still very similar. Here’s the recipe! Enjoy and stay warm! Heat oil in a large cast iron pot over medium-low heat. Add onion, pepper and jalapenos. Cook until soft, about 10 minutes. Add garlic and cook until tender, 2 minutes; stir in cumin, coriander, paprika and fennel seeds, and cook 1 minute. Add tomatoes and season with salt and pepper; simmer about 30 minutes. Add cilantro and a dash of tomato paste to thicken the sauce. Simmer for 20 more minutes. The longer it simmers the more flavorful it becomes. Finish with feta cheese. Place water in a pot with salt to boil. Once water boils, gently crack each egg into the water. Let cook 2-3 minutes. Remove from water; serve over shakshuka. Sprinkle with cilantro. This entry was posted on Monday, January 5th, 2015 at 10:39 am	and posted in Uncategorized. You can follow any responses to this entry through the RSS 2.0 feed.